John M. Sullivan is a seasoned transactional attorney and business leader bringing over 25 years of experience in optimizing results for his clients, partners and business associates. John focuses his practice in the areas of real estate transactions, business acquisition and disposal, loan transactions and works outs, gaming law and land use and zoning. John is a native Las Vegan and active member of the Southern Nevada community. He is a member of Young Presidents’ Organization Gold Las Vegas; having previously served as the president, education chair, membership chair and forum chair for the YPO chapter. He is a board member (emeritus) of Three Square, Southern Nevada’s food bank distributing in excess of 40,000,000 pounds of food to the food insecure in the valley. John also serves as an advisory board member to Project 150, and is a founding board member of the UNLV Rebel Soccer Foundation. 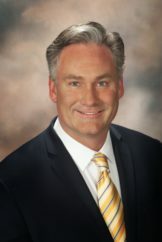 He has previously served on the boards of Nevada Commerce Bank, Bishop Gorman High School, Catholic Charities of Southern Nevada and Variety – the Children’s Charity. John is a member of the State Bar of Nevada and the Clark County Bar Association. He has served as President of the largest Nevada-owned shopping center development company, run two gaming service-related businesses and held two separate unrestricted gaming licenses issued by the Nevada Gaming Commission.